Visitation: WEDNESDAY, February 6, 2019: 2-4 & 7-9 pm at The Dietrich Funeral Homes, Inc., 2480 Kensington Ave., Amherst. Service: THURSDAY, February 7, 2019: A Mass of Christian Burial will celebrated at 10 am at St. Aloysius Gonzaga Church. Cheektowaga. Please assemble at church. Albert J. Duke took the reins of the Buffalo Fire Department in 1985 during a challenging era, with clashes with the union over training and equipment and with the courts over hiring female and minority firefighters. Five years later, when he stepped down, he was lauded by then-Mayor James Griffin for his hard work and praised by the then-president of Local 282 of the Buffalo Professional Firefighters Association. "Yes, we butted heads, but in his 30-some years, he's been a professional," said David Donnelly, who noted that Duke maintained an open-door policy with union officials. Mr. Duke, of Snyder, died on Jan. 31, 2019, in Millard Fillmore Suburban Hospital, where he had been a patient for 10 days. When he retired at the end of June 1990, at age 62, Mr. Duke said, "I have a large family, and I miss them. I haven't had time to enjoy them. I love the fire department. I love the work. I wish I could continue forever. But it's demanding." Through Mr. Duke's career, he was involved in command operations at some of the city's significant fires. He was deputy commissioner during the multiple-alarm blaze that destroyed much of the interior of the Connecticut Street Armory on July 12, 1982, and during the propane explosion at North Division and Grosvenor streets on Dec. 27, 1983, that claimed the lives of five firefighters and two civilians. Mr. Duke was commissioner on Dec. 19, 1986, when a five-alarm fire ripped through the vacant St. Mary's Redemptorist Church and school on Broadway. As commissioner, he not only oversaw the operations of the department, but was on call for serious incidents. At the time of his retirement, Mr. Duke said, "You have to devote yourself 24 hours a day, seven days a week ... You work 10, 12, 14 hours a day, whatever it takes." Mr. Duke was born Jan. 8, 1928, the middle child of Angelo and Anna (Timoneri) Duke, immigrants from Italy. His siblings were Salvatore, Martina, Carmine, Gloria and Joseph; their father was a foreman for the Erie Lackawanna Railroad. Mr. Duke graduated from School 43 and East High School. He enlisted in the U.S. Army in February of 1946 and served in the 1st Courier Platoon as an overhead technician. He was honorably discharged in June 1947. He married Lillian Wise on July 18, 1953, in Buffalo. Two of their children, David and Carla, would go on to become Buffalo firefighters. Their other children were Susan, Angelo and Albert Jr.
Mr. Duke began as a firefighter with the Buffalo Fire Department on Jan. 2, 1958, at Engine 31, and in 1962 moved to Ladder 14, which was in the same house on Bailey Avenue and Doat Street. In 1968, he was promoted to lieutenant on Engine 3 on Broadway and in 1978 he was promoted to captain at Engine 31. 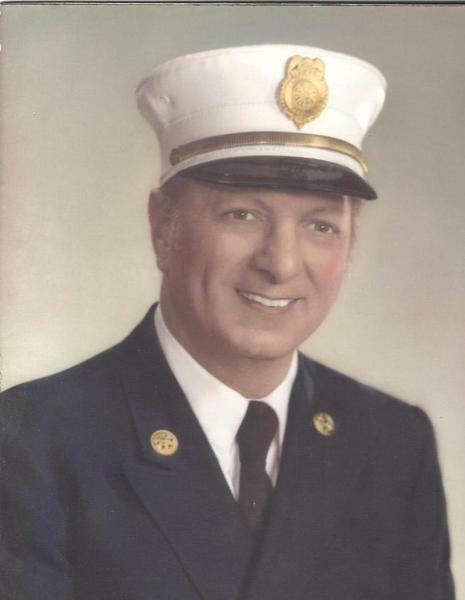 In 1977, he was promoted to Battalion Chief of the B-44 Fourth Battalion; he was stationed in the house of Engine 37 and Ladder 4 at Rhode Island and Chenango streets. He was named deputy commissioner by Mayor Griffin in 1978, then commissioner in July 1985. He held that post until his retirement on June 30, 1990. In 2008, he was cited by an Italian-American organization for being Buffalo's first Italian-American fire commissioner. He was a past board member of the Fire Bell Club of Buffalo. The Duke family saw more than its share of tragedy through the years. His older brother, Salvatore, died at birth, and Mr. Duke lost two of his sons. Albert Jr. died at age 27 on Jan. 23, 1993, after a car crash, and son David died Jan. 5 at age 60 after being stricken at home. "It was really heartbreaking for my dad to lose two sons," Carla Duke said. "He talked about how hard it was to get over the loss of my younger brother, who was his namesake, and then he said he didn't know if he was going to be able to get over losing my brother David," she said. David Duke retired about 10 years ago from the Buffalo Fire Department. Carla Duke, who is at Engine 26 on the Fourth Platoon, said her son, Scott Rogers, is about to enter the fire academy. "We followed in my father's footsteps," she said. Mrs. Duke died on Sept. 20, 2016. Besides his daughter Carla Duke, Mr. Duke is survived by another daughter, Susan Laska; a son, Angelo Duke; a brother, Carmine Duke; a sister, Gloria Pazzuto; 12 grandchildren, eight great-grandchildren and many nieces and nephews. A Mass of Christian Burial will be offered at 10 a.m. Thursday in St. Aloysius Gonzaga Church, 157 Cleveland Drive, Cheektowaga. Memorials may be made to the Wounded Warrior Project or St. Jude Children’s Research Hospital.